1. The first step is to review the Rules & Regulations of the ABC to ascertain your eligibility. 2. The current exam schedule can be found here. 3. If you believe you are eligible, fill out the Short Form Application and send it to the ABC along with payment of the appropriate non-refundable application fee. 4. Once the short form and application fees are submitted, an attorney is eligible to sit for the certification examination. This is true even if the Long Form Application has not been completed. Read more on Exam Information here. 5. ABC Prep Course. The ABC has written a prep course that can be helpful when studyiong for the exam. The course is maintained by the ABI, including the payment. 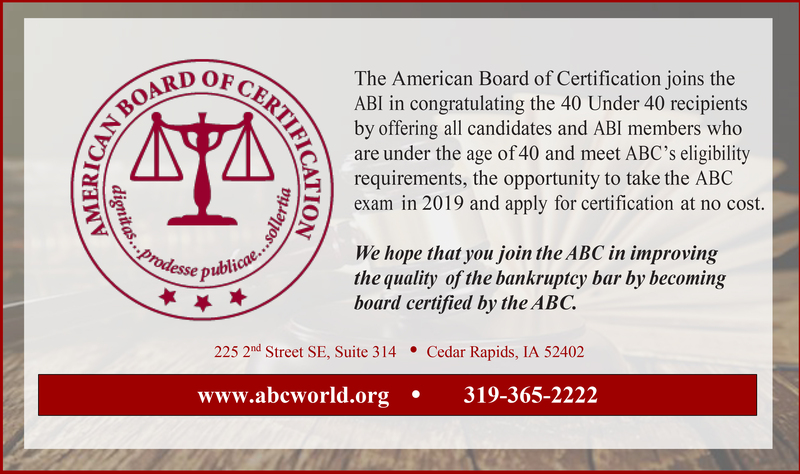 Once registration has been initiated for this course, the ABC is no longert involved until the scheduling for the actual exam. 6. Upon completion of the Exam, the applicant can start working on the Long Form Application. This can be submitted, however it will not be reviewed until after the exam has been graded. The exam can take 3-4 months to be graded. The attorney will have until December 31 of the year following the year in which to complete and submit the long form. 7. Long forms are listed by specialty, and can be found here.